The Bruising Adventures of Girl Clumsy: The People's Choice? Last month I entered myself into a competition run by the Sydney Writers Centre - for the Best Australian Blogs. As I subsequently found out, so too did every other Australian blogger - and sadly, I didn't make the shortlist for any of their specific categories. I assume this is because the penwork of a chronically insecure, attention-seeking journalist with a fondness for theatrics and an almost unhealthy obsession with the song "Africa" by Toto doesn't really fall into the categories of Lifestyle, Business, Commentary or Writing. But no matter. I'm still in the running for the People's Choice award. Mind you, so are about 500 other people, all of them worthy. I guess that means I'll have to take down these worthy, talented writers with the gutter tactic of tacky self-pimping. So! If you like dropping by Girl Clumsy Dot Com, and you are in possession of a finger that can initiate mouse clicks with a minimum of physical exertion, then I urge you to vote in the People's Choice section. They're listed in alphabetical order, so I'm about four pages in under "T" for "The Bruising Adventures of Girl Clumsy". I will also take this opportunity to remind you about Prognosis: Death! Delirium, opening this Thursday 5 May at the Brisbane Arts Theatre. This is ImproMafia's flagship show - a spontaneously created sci-fi schlock medical comedy soap opera, each and every night! You can book tickets online now - it's just $15 per show, or $10 concession. You can also save heaps with our special Season Pass - you get to see ALL SIX SHOWS for just $50 adults, or $35 concession. If you see four or more shows, it's incredibly worth it. And you'll want to see four or more shows. Because we're awesome. 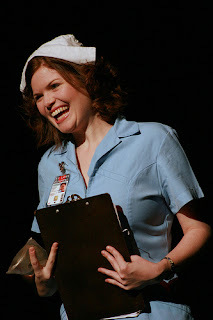 My character, Nurse Lottie Buble, has had a tumultous few years at St Love Hospital. At the end of last season, she finally tied the knot with her on-again, off-again beau Dr Burton Mangold - only to have her first husband, 25 star General Thaddeus King, storm in and punch out her groom! So now, bigamously married and with a very pooty Dr Mangold to contend with, it's going to be another rocky road of romance for Nurse Buble. All your other favourites will be back too - Dr Melody Carmichael and her "pigeon" Dr Ludwig LeStrange, Medical Superintendent Harold Dean, and hospital psychologist Professor Helmut Von Lickenspiel. But that's not all... there'll be some new faces and maybe even some old ones. If you're in Brisbane - please come along! I'd love to meet readers of this blog - particularly if you vote for it in the People's Choice awards. See, told you I was tacky. Kudoes to Kris Anderson - nice photograph!!! The blog is quite amazing and wonderful and will really help, an originality found in this blog which tells that how mechure is that.This is my Good luck that I found your post which is according to my search and topic, I think you are a great blogger. I really really wish this would work.this is my Good luck that I found your post which is according to my search and topic, I think you are a great blogger, thanks for helping me outta my problem. I thoroughly enjoyed your play: Prognosis: Death! Delirium! It was an exemplary mimicry of evolutionary cul de sacs engaging in performing arts… good use of irony and sarcasm to critique mainstream entertainment and media today.